I served this dish with pork and baked potatoes. The apples and grapes gave the endives flavour and the pork moisture. On their own, they tasted like… boiled cabbage. While I was making dinner a friend came over to pick up her son and she said she cooks with endives regularly. It gave me confidence to persevere with the dish. She also said she uses it raw, adding it sparingly to salads. And there ends my entire experience and knowledge of endives! We are flying to Queensland as I post this week’s recipe. A week of theme parks, beaches and galleries! But I’m curious to see how the rest of the French Fridays with Dorie group felt about this dish and I am already looking forward to catching up when I return! Tags: cooking, food, french fridays with dorie, recipes | Permalink. Endive is something I can take our leave – caramelizing it does add some interest. I love endives in salads (esp. with blue cheese and walnuts) but this was my first time cooking with them. On their own, I thought that they were a bit too bitter for my tastes. But alongside the fruits and chicken, I thought that they were actually really good. Somehow the whole dish seemed to balance out. Your dish turned out just like Dorie’s! I have the same problem with endives I cannot decide if I hate them or not! But I’m definitely in love with the grapes!!!! Your picture is super!!! I didn’t know what to expect from the cooked endive, but did like it in the end, maybe not quite as much as I liked those grapes… Have a great vacation! 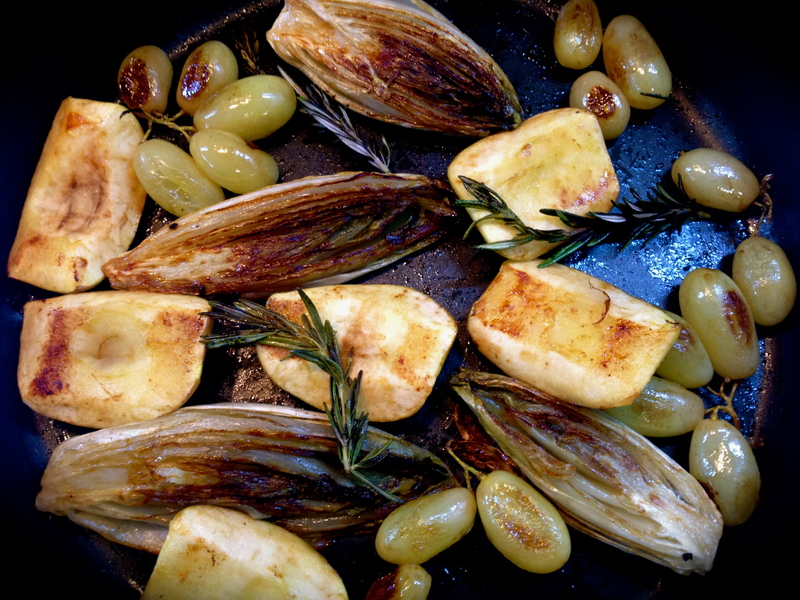 Your presentation with the caramelized endives look wonderful – this was quite an intriguing recipe. Porc and baked potatoes sound delicious with this. Thank you also for taking the time to visit my blog – I hope you had/have a terrific vacation! enjoy your vacation! loved your post this week!